I’m wearing an Eddy Chaco pendant from my late mother’s collection. Info please Paula. 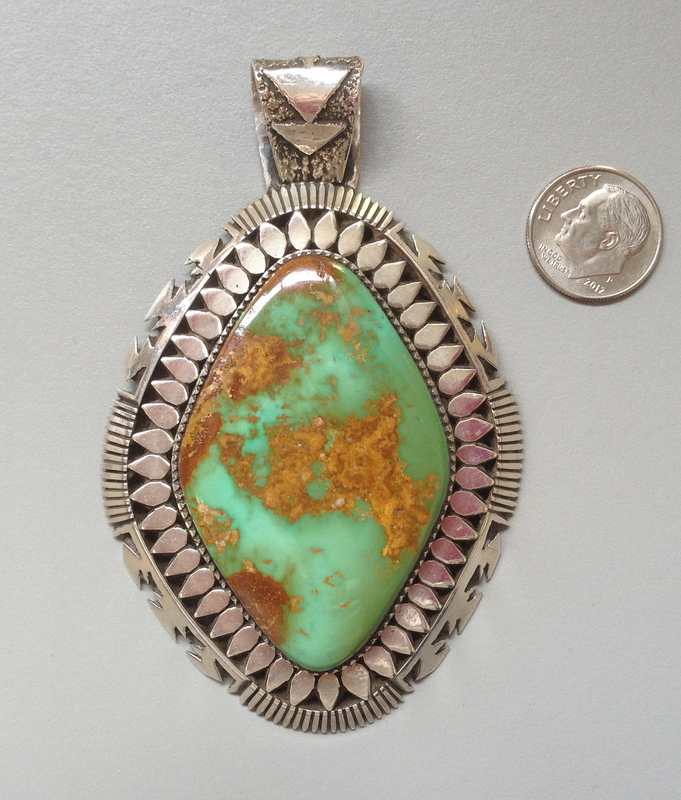 Hi – My mother, who passed away recently, had a lot of Native American turquoise jewelry – squash blossoms, pendants, bracelets etc. Today I am wearing a pendant I pulled out. It is a large, heavy silver (although I can’t find a sterling mark) thing with a large diamond shaped stone. 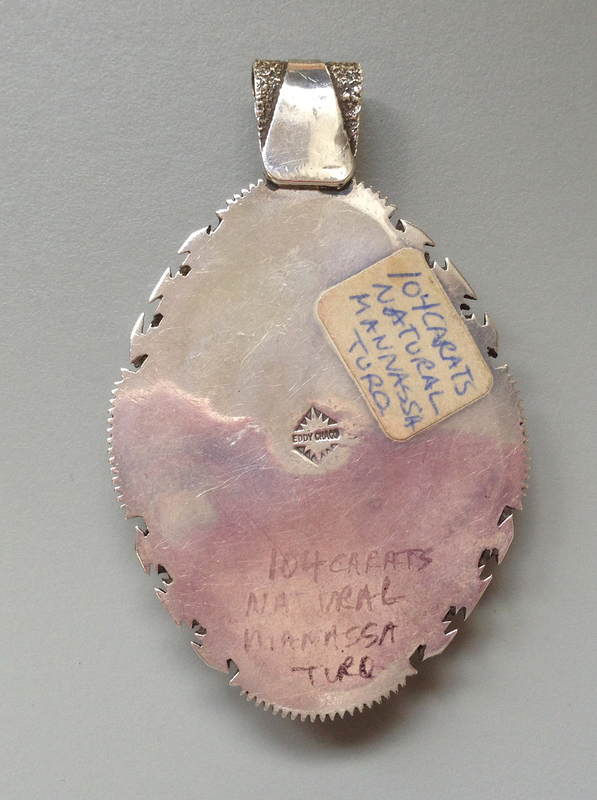 It is stamped “Eddy Chaco” and has a small label which says “104 carats natural Mannassa turq”. Is that a known artist? How old might it be? Is it valuable? Here are a couple of photos. 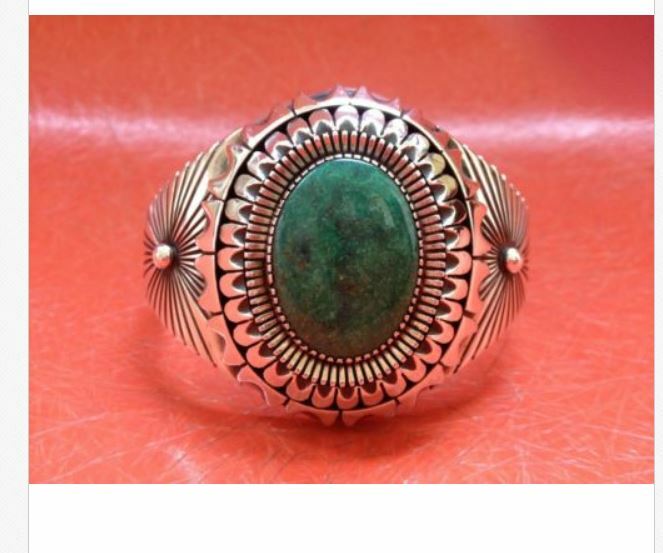 I’m not interested in selling, just curious about the maker and age and what sort of chain would be appropriate for this style? What a positively beautiful pendant ! 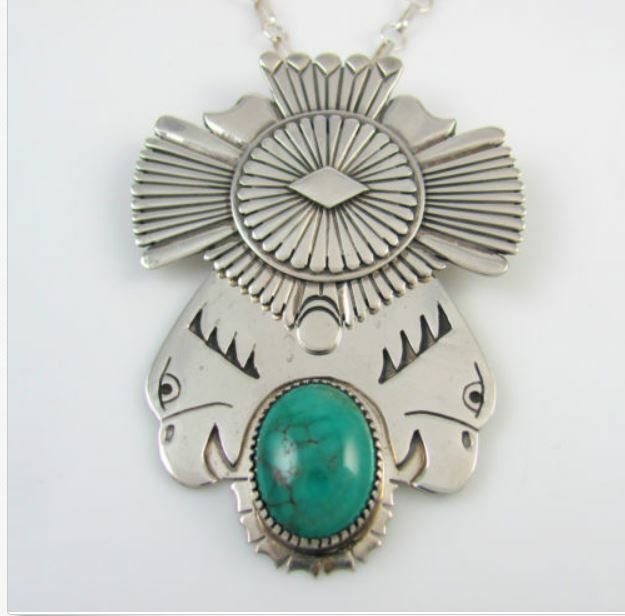 Artist: Eddy Chaco is a Navajo artist known for traditional, hand wrought items. 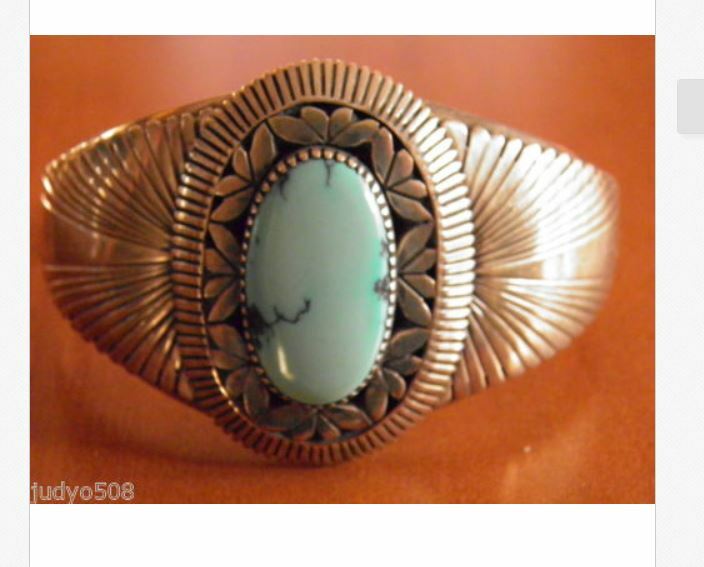 He was/is the silversmith for Ney Trading Post of Albuquerque, NM. I had a beautiful bracelet made by him that was just too large for me and sadly, I had to sell it, but you can see more about it by clicking on the photo. Age – He is contemporary so you would have the best idea of the age of the piece by determining when your mother might have purchased it. Value – I did a search on eBay of sold items by him. Mine – King’s Manassa (Conejos County, Colorado) is best known for its brilliant greens and golden and brown non-webbed matrices, but blue and blue-green stone is found there as well. This site, east of the town of Manassa, was originally mined by Ancestral Pueblo peoples. It was rediscovered in 1890 by gold prospector I.P. King, and his descendants still work the claim. Chain – If that were my pendant, I would wear it on a collar or omega.